When I was a kid, there were things that my dad taught me about cars that I figured no one else knew about. I just never ran across anyone in my social sphere that had much knowledge or interest. But the Internet changes everything. Clearly there are thousands of people that are interested in the same things I am, and most of them know more than I could ever hope to. We look at some more of those people in this week’s Thursday Drive-By. Do you like car jumps? Watch the General Lee take to the skies courtesy of the Hemmings Blog. Concept cars your thing? The Palm Springs Automobilist has you covered. You’ll even find a little local car racing mixed in with a vintage California Corvette club. See all the good stuff below. The Palm Springs Automobilist’s profile picture shows him polishing the wheel of his beloved Chevette, so it might be easy to assume his content would be lacking. That’s not the case at all, however, as he posts all kinds of great stories about old concept cars and other automotive history. In this story, he looks at the 1961 Buick Electra “Flamingo” show car. 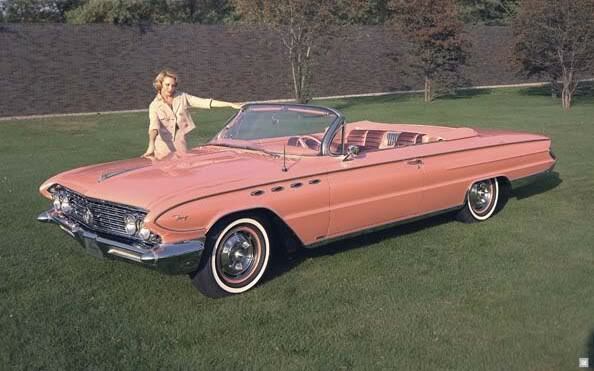 Specifically, he theorizes that the lavish, leather-clad, swivel bucket seats were previously seen in the 1956X Buick Century show car, then removed and recovered for the Flamingo. I don’t know if that’s right or not, but I can appreciate someone analyzing it this much. Plus, it’s just great to see pictures of these old Motorama cars again. Check out the link here. This is sort of a sobering article from the New York Times that one of my co-workers passed along to me. It basically talks about how young people aren’t nearly as interested in cars as they used to be, and how General Motors is turning to places like MTV to design cars that appeal to the teen-to-twenty-something demographic. I believe the old car hobby is in serious jeopardy if future generations don’t embrace it. If people are growing up with the expectation that cars are primarily appliances that help them stay connected to the Internet, where are the classics going to fit in? 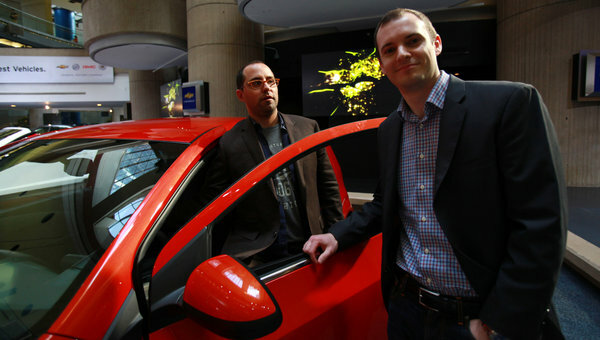 Anyway, look into the future of automotive marketing and design by clicking this link. Frank’s Classic Car Blog recently ran across a junkyard full of what appear to be mostly mid-to-late’’70s Cadillacs somewhere in the deserts of California. It looks like they’ve got the market cornered on ’76-’78 Sevilles, judging by the picture. My dad used to have these DeVilles and Sevilles around the house when I was younger, so it brought back some memories for me. I always look at cars like this in their sun-baked, dilapidated state, and imagine what they were like when new. Those Sevilles in particular were very expensive cars in their day. People spent good money to buy those cars, take care of them, detail them, and show them off to their friends. 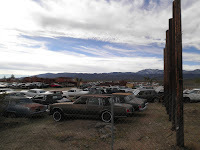 But then at some point, the luster wore off, and they ended up in this junkyard. See Frank’s take at this link. 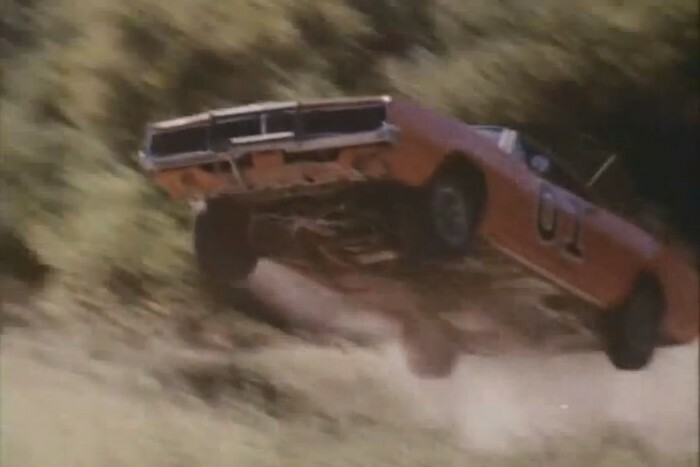 The Hemmings Blog dug up a video that shows every General Lee jump during the first six seasons of the Dukes of Hazzard. Now I know the Dukes of Hazzard is a dumb show. But I loved it as a kid, and I still like it as an adult. Think about what they were doing just with these jumps. Someone was driving that car off a ramp, flying through the air, and destroying it when they landed. It’s unreal that someone would be willing to do that, but they managed to crack one or two off a week. That’s amazing to me. Plus, this is one of the few shows that I watched when I was younger that isn’t full of murders and stuff so I can watch with BHo without feeling guilty. See the video here. You don’t hear about it on the news or hear people talking about it in the office, but there is a huge culture of short track stock car racing in the Kansas City area. It has been here for more than half-a-century, and it is a big deal. Ron Haw’s Picture Me Racing has been snapping race night action photos and winner’s circle shots for decades. Right now, they cover Lakeside Speedway and I-35 Speedway, and they do a fantastic job. You can see recent photos of all the thrills and spills from those two tracks, and even purchase your favorite pictures, by visiting this link. The Jalopy Journal has an awesome video of a southern California Corvette club driving their cars out of a parking lot in 1958. There’s no sound, but the footage of these ’53-’58 Corvettes is just fantastic. Many of the cars are slightly modified, and you can also see other great cars in the background. The black ’56 or ’57 in the picture appears to have ’55 Buick wheel covers, and the one on the front seems to have the Buick spinner. Anyway, as someone who grew up with a straight-axle Corvette, I can’t get enough of these cool old cars. And the fact that this point in time was captured more than 50-years ago makes it that much better. Take a look—I know you’ll enjoy it. And like I/we need some newspaper [and a p*** poor one at that] to tell us that kids care not for cars anymore. And GM [Ford is guilty too] is making a HUGE mistake in pandering to the 'mtv watchers' - there is no future in that demographic. But thats an hour or two rant for another time [and place]. Thanx again, as always, for posting these. I'll spend an inordinate amount of time later looking at the Motorama cars and re-watching the Corvette video, as well as reminiscing about Daisy Duke, um, er, uh, I mean the Dukes of Hazzard TV show and the technical difficulties entailed in its production.